High quality self-aligning ball bearing. Our company stock this type of bearing, so if you need to order high quality self-aligning ball bearing, you can contact us at any time! The products we sell are original, so please rest assured to buy! Self_aligning ball bearing has two rows of steel balls, a inner ring that has two raceways and a outer raceway in the inner spherical shape, and is provided with the function of self-aligning. The bearing can automatically compensate the concentricity error caused by the shaft deflection and housing deformation, thus suitable to the applications where the bearing seat hole can not guarantee strict concentricity. so it can still works as long as the relevant gradient between the center line of the inner ring and the same of the outer ring is within the range of 1° to 2.5° when the shaft is bent or tilted under pressure. 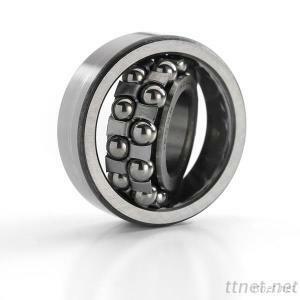 There are two types of self_aligning ball bearings, i. e., cylindrical bore and tapered bore bearings. The taper ratio of tapered bore bearings is 1: 1 or 1: 30. Be applicable to the low noise electrical engineering, automobile, motorcycle and general machine etc.